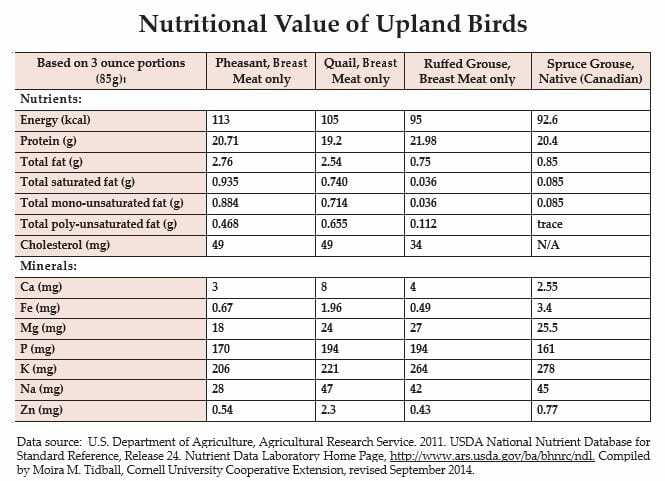 Now how to make a lean morsel of upland bird tender and flavorful? Using an oven cooking bag traps in the moisture and creates even cooking of the birds. This recipe is pretty simple and can be used with other species of upland birds and even ducks. 2. Rub grouse evenly with melted butter and season with poultry season, salt and pepper. *If using skinless birds you can wrap some bacon slices around the birds for extra moisture and flavor, but not necessary. 3. Place some apple and-or onion slices inside the cavity of the birds. 4. Follow instructions on cooking bag to add 1 tablespoon flour to the bag, shake and place bag in baking dish. 5. Pour cider, stock, or wine into the bag. 6. Place grouse next to each other in the cooking bag. Close bag and secure with the nylon tie provided. Make 6 slits in the top of the bag (not the sides or bottom as you want to reserve the juices). 7. Place in oven and roast about one hour until cooked through (165°F on a meat thermometer and juices run clear when thigh is pierced). If birds are not nicely browned, slit bag down the center and fold back, being careful not to spill any juices. Place back in oven and cook about 15 minute more until browned. 8. Gently lift out birds and place on carving board and tent loosely with foil, removing the apple and onion from the birds. 9. Pour juice from bags through a strainer into a 10 inch skillet. Simmer the juice until it is reduced by about half. Drizzle this under and over the birds for serving.